May is already over so it’s time to update that To Do list and talk about recent progress! Also a short recap of last month’s events and more! Click here to see the updated To Do List. May was the month we attended both BitSummit and Dokomi – which included a fair bit of preparation and traveling. That is why we expected (and calculated) that less work would get done this month. However, despite all this we actually made some pretty good progress, especially towards the end of the month. With the way things are going, we still hope for a release of version 1.0 around end of Summer. Things are happening in Sapphire Ridge and it somehow involves this bamboo fountain. Additionally, new optional temples are emerging in Gaia’s Garden! Finally, we even managed to squeeze in a little quality of life improvement: availability information in the inventory. Note: the information shown in this screen is just an example and not accurate! 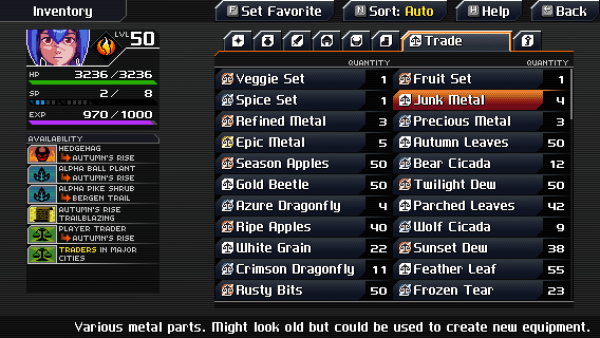 No, Hedgehags will not start dropping bare Junk Metal! As announced in last post, we attended both BitSummit and Dokomi presenting CrossCode! 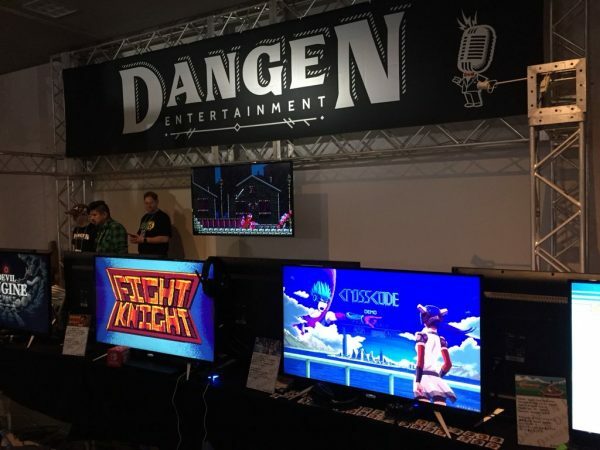 CrossCode at BitSummit next to all those other great games published by Dangen like Fight Knight and Super Sportmatchen… check them out! 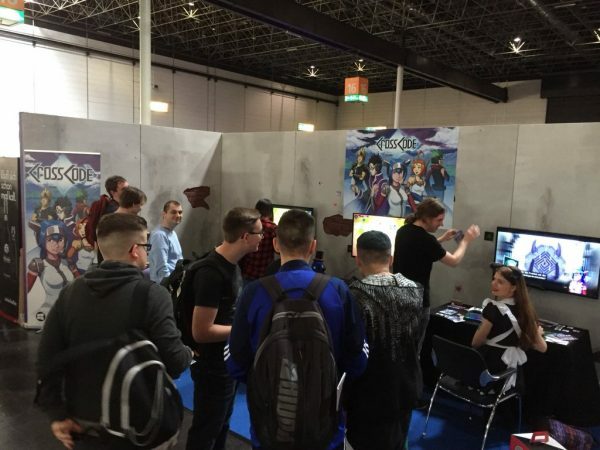 Our large CrossCode booth at Dokomi, this time organized by Indie Arena Booth right next to lots of other indie developers! Anyway, that’s all for events! From now on we’re 100% focused on finishing this game! And what else? Oh yeah! To everyone’s surprise, we actually won our very first award! 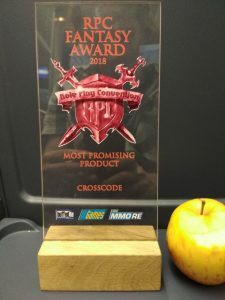 CrossCode got the RPC Fantasy Award for Most Promising Product at the Role-Play-Convention in Cologne, Germany! Yay! And that’s all! Until the next update! 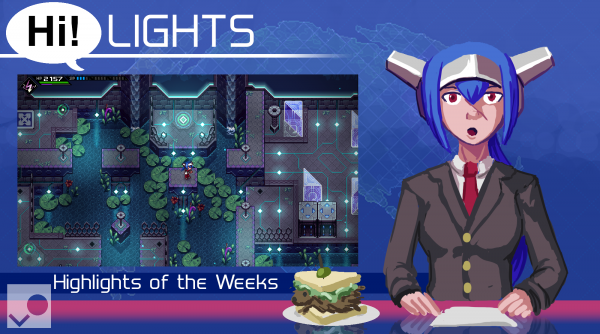 This article was posted in CrossCode, Highlights of the Week. Bookmark the permalink. After 1.0.0 release can we get Trading Cards on Steam so I can get a CrossCode profile background and achievements.. I know it’s probably not really on your list of priorities, especially after the official release, but it’d be pretty nice to display my love for this game in some other way than having it set as my “Favorite Game” on Steam. I was talking about Steam badges, and I got mixed up and called them achievements on accident. I would proudly display a “VIRTUAL RICHOCHET PROJECTILE! !” badge haha. Who even calls them ‘balls’ anymore, it’s 100% VRPs. +1 for the steam badges and cards! I have nothing particular to say, only that I support you guys in your last months of development. Your game is gonna be amazing, good luck! I can’t wait! I stopped playing after the 2nd temple so I could experience running through the finished product. Every update makes that waiting even harder but I have faith you in guys. This game is going to be amazing. Hypothetical question, if this game gets a speedrun at SGDQ would you guys attend or maybe even do a video conference during the play session? I think it would be pretty cool to have the developers watch someone blast through their game and see them manipulate the environment. 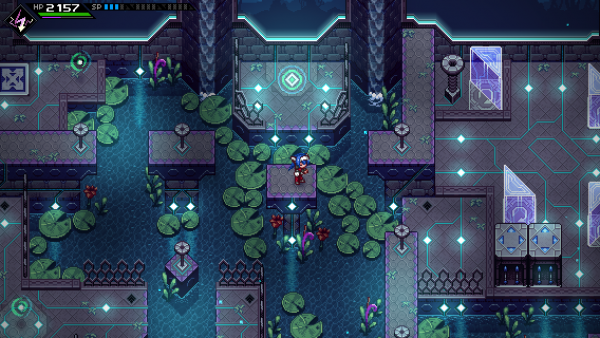 If CrossCode actually is played at SGDQ (that might be difficult because it’s a long game and hard to finish below 2 hours), we’d love be around! Not sure if we can afford traveling to the event (we’re based in Germany so it’s quite some distance) but a video conference sounds doable! hi, i’m a newcomer. If i play the last steam version of the game right now, where do i supposed to stop? 50% of the mainquest? 70%? can’t wait for the release, i’ll play it again from the begining to analize every goddamn new detail in the fina version. 1.0 release is going to be the fulfillment of a dream. There is no other game–absolutely none–that plays better on a Steam controller. Super excited for this game! From what I’ve played it’s extraordinary! The smooth gameplay of an Ys game with the complexity of an MMO. You guys should make a Metroidvania game after this! I bet you’d give it the love and attention to detail that genre deserves.